Here's just a small sample of some of our projects. Founded by local meteorologist and entrepreneur Beau Dodson, the Shadow Angel Foundation began as an outpour of community love following a deadly tornado in Southern Illinois. Money was raised, homes were patched up, but we realized donations alone couldn’t fix the broken hearts of the smallest members of our community – our children. We expanded our mission to focus on children going through any kind of hardship – from natural disasters to poverty and abuse. Our founder, Beau, received a Six Who Made a Difference Award from WPSD-LOCAL 6, which was given to six residents of the four-state area who served their community in extraordinary ways. The award was presented for the work Shadow Angel did following the 2003 tornado. Beau served as an American Red Cross shelter manager at the Houston Astrodome following Hurricane Katrina, extending our mission across the nation. 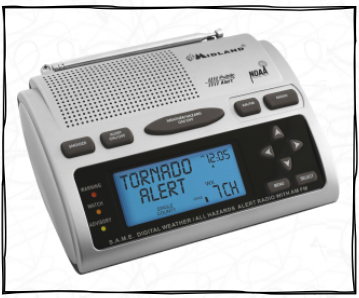 We help bring tens of thousands of weather radios into the homes of local residents. We first started a NOAA Weather Radio program at WPSD TV 6. Other stations soon began their own weather radio program. Countless weather radios have also been given away to local residents. The foundation is a strong believer in NOAA Weather Radio. The foundation is a strong supporter of the NWS weather service. The Foundation was awarded the Mark Trail Award, a National Service Award, for our efforts to promote the NOAA Weather Radio Program. We had our largest Teddy Bear Drive to date, with over $7,000 raised to purchase hundreds of bears for Child Watch and the Purchase Area Sexual Assault Center. We teamed up with community members to benefit the Guardian Family Service Center, a women’s and children’s shelter in Metropolis, Illinois, through a matching fundraiser. We raised $8,000 to match the community’s $9,000, together bringing in over $17,000 for the shelter! In 2017 an arts scholarship was started in memory of Justin Croach. Justin, at the age of 18, took his own life. Justin fought depression for many years. This scholarship is meant to help keep the memory of Justin alive. Justin was a talented artist and loved music. The scholarship is for senior students at Massac County High School.